Congratulations to Bill Wirtanen on his induction into the Mesabi Range College Athletics Hall of Fame! Bill’s achievements and true legacy are the countless lives he has touched throughout his 42 years as an educator. He earned his master’s degree from SIU in 1957, and since then, has been the recipient of numerous honors including his induction into the NJCAA Wrestling Coaches Hall of Fame in 1981 and the Minnesota Community College Athletic Association Hall of Fame in 1997. In 2001, the Mesabi Range College dedicated the gymnasium in Bill’s name. Additionally, two $500 scholarships are awarded to students enrolled at Mesabi each year. Bill’s hard work and dedication continues to shine through his long line of coaching, educating and inspiring. 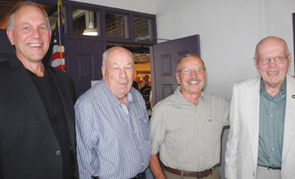 PHOTOGRAPH L to R: Tim Olson, Jim Mayasich, Rod Halunen and Bill Wirtanen are pictured at the Mesabi Range College Athletics Hall of Fame induction last month.